The focus of 2016's AMD CPU line-up is a processor that doesn't exist in retail form. Codenamed Zen, the brand-new architecture is mooted to deliver meaningful gains in performance over anything currently residing in AMD's arsenal. Depending on what you read and how much of it you believe, Zen has the potential to give Intel's premier CPUs a solid run for their money. That's good news for the enthusiast. We'd happily trade a little performance loss for a reduced TDP, enabling quieter systems in truly small-form-factor chassis, so the A10-7860K's stats read well. The K suffix, of course, means the processor is unlocked on both the CPU and graphics, which is handy if you want to squeeze a touch more performance out of an architecture that usually presents itself in a 95W thermal envelope. It's easy to imagine one of these processors in a sub-£500 base unit that's also equipped with a graphics card capable of high-quality graphics at a 1080p resolution and, given the falling prices of SSDs, a fast boot drive with adequate capacity. 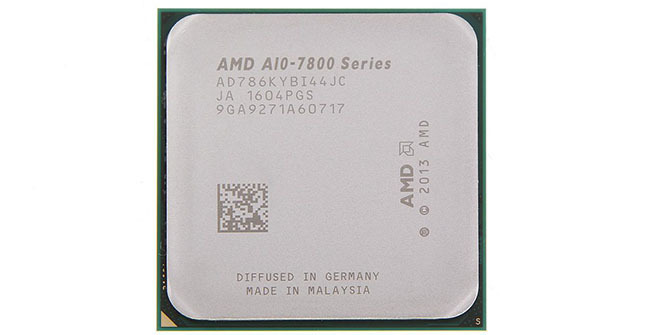 The A10-7860K, then, is very much a mass-market processor. We're using the pretext of receiving an A10-7860K sample to examine the relative performance of sub-£100 CPU-and-GPU processors from AMD and Intel. Batting for the blue team in this two-way line-up is the Skylake-infused Core i3-6100, outfitted with a 51W TDP, and officially retailing for a dollar less than AMD but actually costing a few more pounds at UK retail. Both processors harness the latest technology from both companies, so why not join us to see which one is the better overall bet for a budget system?